Alice Thomas is Refugees International’s Climate Displacement Program Manager. MARRAKESH, Morocco, Dec 10 2018 (IPS) - The fact that a handful of countries have indicated their intention not to come to Marrakesh to endorse the compact signifies how the issue of migration has been politicized and become a political flashpoint. Unfortunately, certain right-wing, political parties in some of these countries have been successful in misleading the public regarding what the compact is, and what it seeks to achieve which is to promote cooperation among countries of origin, transit and destination to ensure that migration is safe, regular and orderly. Moreover, with respect to countries like Switzerland – which was a co-chair of the process to develop the compact — there is nothing in the compact that is contrary to its current policies and practices. This demonstrates how the compact has been mischaracterized for political purposes. Ultimately, however, that a handful of countries may not come to Marrakesh should not detract from the fact that over 180 nations will, meaning the compact has received overwhelming global support. What is unique about this is that countries that are withdrawing are doing so despite the fact that (a) the compact is non-legally binding, and (b) all of these countries (other than the U.S.) participated – presumably in good faith – in the 18-month process to negotiate its terms, yet are now not supporting it. How effective is the compact if its implementation is only voluntary? The compact will only be effective if countries move forward with its implementation. However, what is important is that the compact’s 23 objectives embody a comprehensive set of best practices for managing migration in a safe, orderly manner which requires the cooperation of countries of origin, transit and destination. In other words, implicit in the compact is the understanding that not implementing these practices results in unsafe, irregular, and disorderly human movement, in loss of life, in human trafficking, in exploitation and abuse of migrants in situations of vulnerability including children, etc.. It results in a failure to address the factors in countries of origin that are driving more and more people to migrate out of necessity and desperation, not choice. It also seeks to protect persons in situations of vulnerability who are not squarely included in the Refugee Convention, including those compelled leave their countries due to disasters and the adverse effects of climate change. All countries need to address these drivers, to promote practices that ensure that people are moving safely and regularly. At the same time, the compact recognizes the sovereign right of every nation to manage its borders. As such, that a country does not want to implement these best practices is contrary to its own self-interests. Political parties will come and go, but ultimately, over the longer-term, the compact should prove effective in improving migration governance and in addressing the current challenges of migration in a smarter, more effective way that is everyone nation’s interests. Has the concept of refugees undergone a dramatic change? The concept of refugees has evolved. There are over 258 million migrants today (that is 1 in 30 people) most of whom migrate for economic reasons, to gain skills, to fill labor needs in countries of destination, and to support their families and communities back home through remittances. 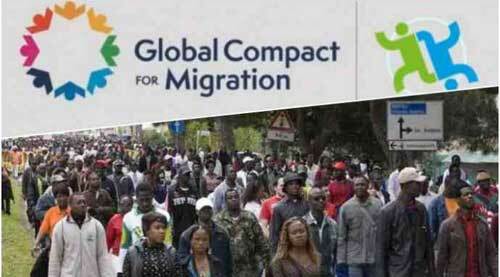 In fact, unlocking the full economic potential of migration to contribute to GDP and sustainable development in origin and host countries is much of what the compact is about. What has changed is the fact that increasingly, more and more people are migrating not out of choice – not as “economic migrants” – but because of other drivers like generalized violence, corruption, and the impacts of climate change in their home countries. These persons are not included in the definition of refugee under the 1951 Refugee Convention, despite the fact that they are in “refugee-like” situations meaning they are in need of some level of international protection. One of the goals of the compact is to ensure that those migrating out of desperation- and who are not protected under refugee law – are not exploited or abused, and that their human rights are upheld.